Justin Lambert received his BFA from Florida Atlantic University, and his MFA from Indiana University. Justin has spent the last 15 years firing utilitarian pottery in wood burning kilns. Investigations into reduction cooling in the teardrop anagama adds dramatic decoration to the subtle curves in his pots. In addition to running the studio, Live Oak Pottery, Justin maintains an apprentice program, Chairs the ceramics department at the Lighthouse ArtCenter, teaches ceramics part time at Palm Beach State College, and travels for firing workshops. Justin is also a licensed USCG captain, and runs fishing charters on the side. He enjoys spending time with his wife Andrea, and their dog Ozzie. An interest in objects that serve a specific purpose motivates me to make functional pottery. I am also interested in how pottery can inherently initiate a certain situation with a single user and within a group. It is through the grouping of particular pots that I am able to suggest a special moment to occur. It is the interaction of my pots with the user that lead to certain scenarios alluding to the ideas of companionship and solitude. Groupings of bottles or cups are about inviting myself, and the viewer to slow down and take notice of the subtle diversities in form and the infinite variety of surface texture and color attainable through wood firing. The scale of my work brings the viewer in close to examine the subtleties of form and surface, and creates a more intimate experience through its utilitarian qualities. Ultimately, my potsâ€™ purpose is incomplete until itâ€™s put to use. The firing process I choose provides a direct interaction between the clay and the user. My work is not covered with any glaze, rather the firing itself glazes the work, enriches the surface and brings out intrinsic color from the clay. My investigation into smooth kaolin clay bodies in wood firing leads my research. I reduction cool these kilns to achieve deeper colors, and to explore a palette somewhat unknown. Frosty, wet, movement rich glazed surfaces provide information for future work, and my careful analysis of surface to form integration provide insight to new formulaâ€™s and firing schedules. 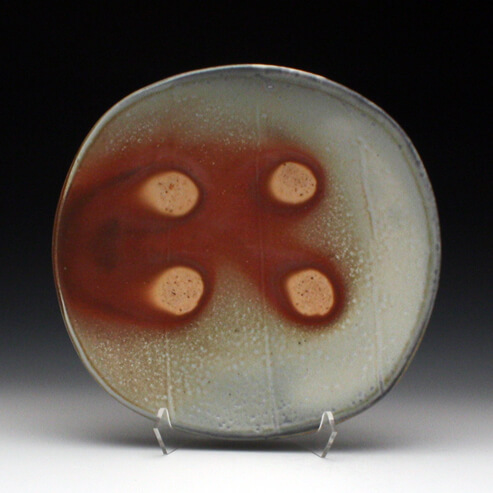 My work is influenced by pottery from all cultures, but more specifically Southeast Asia, including Oceania, and Africa. I feel these cultures primary concern when making pottery was itsâ€™ function. Form simply followed function and some of the most amazing pottery in the world was made. Their honesty, simplicity, necessity, and beauty are the qualities I strive for in my own work.